We present: a concise history of Citybikes. Citybikes was founded in 1986 by Roger Noehren, after a worker split from the Bicycle Repair Collective with designs on starting a bike shop catering to the three-speed city rider. Sharing a storefront with the Bicycle Commuter Service, Citybikes became a repair shop and clubhouse for commuting and touring cyclists. Maps adorned the walls, and comfy chairs and a library welcomed visitors. Five years later, the owner had tired of sole proprietorship, and was realizing the advantages of the collective structure. He decided to sell the business to the current workers, and encouraged them to form a cooperative. Some resistance to taking responsibility for the shop was lessened when a coop-enthusiastic worker was added to the mix, and by the end of 1989 Citybikes was ready to incorporate. 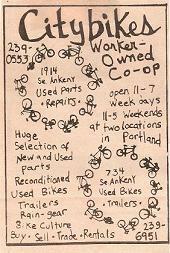 The business was sold for $12,000 to the five workers, and they formed Citybikes Workers’ Cooperative on January 1, 1990. Flats were fixed, hubs overhauled, fenders installed, and business was chugging along. After a few years working at another shop, the founder returned to become a part of the cooperative. It became apparent in the mid-90s that Citybikes had outgrown its home. At a breakfast meeting the morning after touring a possible space, we decided to rent it. Bike sales and rentals readily filled the new space. We shared the building with a printing shop, and when they vacated three years later, we hosted the World Naked Bike Ride during Bikesummer, and then we moved our stock into our current warehouse. The repair shop building has remained our home since the beginning. We doubled the cramped shop space in early 2009, and it has never been better. As we witness the many changes to our neighborhood and indeed greater Portland, we are staying true to our philosophies and looking forward to the many years ahead!